Welcome back to this week’s Parenting Pin It Party and after the excitement (or frustration) of the Rugby over the weekend (did you see the England v Wales game?) we are back with the lovely us again, and we will be sharing the wonderful posts she discovered from last week’s party. Do pop on over to see who is on her feature list this week! Usually, it is Romanian Mum, but she is taking a break, so we are back with us again…hope you don’t all mind. As always, we have picked our two favourite posts from last week for you to take a look at. If you are lucky enough to get chose, do grab out featured badge won’t you? Find a post that you are rather proud of and would like others to see, bearing in mind that it does have to be parenting related but can be anything from craft to what you did with the kids last week. Put the link to your blog post into this post using our rather handy and neat little tool at the bottom of this post. If you need a bit of help or are stuck with what to do then please drop us a line, or tweet me and I will gladly help. Add the badge from the host to your page so that we feel the love. Here is the code for the badge you will need for this week’s post – it is me now! This is the board that we pin your posts to – what do you think? 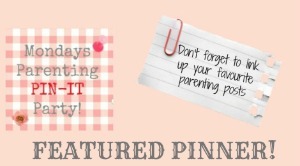 Follow jbmumofone’s board Mondays Parenting Pin-It Party! on Pinterest.